Down in the lair, Leo, Mike and Don are scarfing down a peanut butter and jelly pizza. Don invites Raph and Ninjara to join them, but Raph refuses. He has a candlelit dinner waiting for Ninjara and him on the roof of April’s apartment building and nothing, absolutely NOTHING, is going to ruin their perfect evening. Naga begins to childishly mock the exiting lovebirds as the news report Splinter is watching warns of a chance of rain. On the street, Raph promises Ninjara that they’re going to have the perfect evening. Suddenly, they spot a thief stealing a TV through a window. 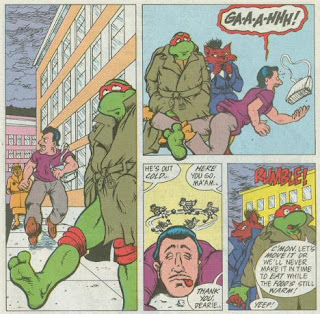 Raph stops him and terrifies the guy into running away, screaming. No sooner do they get their date back on track, a purse-snatcher knocks over an old lady, leaving Raph and Ninjara no choice but to be sidetracked again. As the rain begins to come down, they still haven’t made it to April’s building, as now a little girl has lost her cat down an open manhole. Raph climbs into the sewer and retrieves the kitty for the child as the rain begins to pour. Unfortunately, Raph fails to notice a huge wave of rain water rushing down the tunnel his way. Raph is carried away in the flood and Ninjara, worried, dives in after him. She is swept away and loses consciousness. Ninjara wakes up a little while later in Raph’s arms. Being a turtle and all, he was never in any danger of drowning, so she had nothing to worry about. Their plans ruined, Don brings them some leftover peanut butter and jelly pizza (and also drags the mocking Naga away). 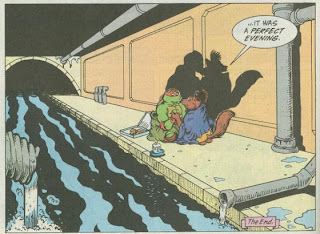 As they sit alone in the tunnel eating the cold pizza, Ninjara assures Raph that it was the perfect evening. *As with “Fox Trap!”, I would place this story after TMNT Adventures #52. Well, we finally got that “Raph and Ninjara go on a date” story that’s been long overdue in this book. 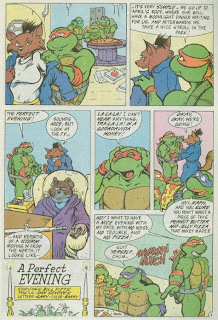 Not that I wanted TMNT Adventures to become overrun with romance subplots (that’s what narrowly destroyed Archie’s Sonic the Hedgehog book a few years before Ian Flynn turned it around), but something to make us believe that they’re actually in love beyond the text telling us so had become necessary. Their romance always just felt so artificial to me. Dan Seneres turns in some strong pencils and Bill Fitts writes a cute if not especially hilarious script. I got the biggest kick out of Raph so nonchalantly defeating various petty criminals. After besting guys like Armaggon, the Shredder and the Biblical Four Horsemen of the Apocalypse, a purse-snatcher is really just beneath him. There’s some good character work on Raph in here, such as the way he tries to ignore the weather report or how he insists on wanting things to go perfectly. It’s “romantic” while still being in character for him; you can tell Raph’s trying but it’s not something that comes naturally. I don’t know how or why Barry Grossman did this, but Raph spends several pages of the story with an orange bandana, making him look like Mikey. Not just a panel or two, but whole pages. It’s a little distracting, but the only knock I can make against this story. While long overdue, “A Perfect Evening” is actually kind of perfectly timed in its release. Right after this issue was published, TMNT Adventures began a storyline that saw Raph and Ninjara break up and lose each other forever. They spent most of that story arc fighting, too. So a story like this, that sees a rare instance of them being happy together, has a bit more impact when just around the corner is their ultimate break up. I never thought about this story as being the Archie TMNTA equivalent of Marvel's "Sensational Spider-man Annual #1" but the parallel kinda fits... just without the whole memory erasing-time alerting deal with the demon subplot in the Moon Eyes saga.